Why mathematicians ignore holidays: Oct 31 = Dec 25. This is a freezer full of tomatoes and peppers. Apparently the hot dry summer produced an insane number of peppers - we were still getting them the week before last - and I bought a half bushel of Roma tomatoes to freeze. I will be so happy using these during the cold, dark months! Right now, I've got a pot roast in the crock pot with purple carrots, orange carrots, kohlrabi, celery root, onions, garlic, and kale. The purple carrots have stained the white veg a bit, but not as much as they do in a chicken stir-fry. Purple meat is a little odd. I'm lucky to live where there is both farm land and a large enough population to support local agriculture. There's the vegetable CSA from June to the middle of December which provides veg and eggs. I also get raw milk cheese from a local producer, and have a share in The Piggery, where I can buy local, humanely processed meats. Yippee! Our CSA started up again today with many leafy green bits plus turnips and eggs. I've used up a lot of what I dehydrated last season, particularly the spinach, so it's nice to start over. I turned the finished wrap over to the Hangar Theater to be part of an auction basket for the play Penelope of Ithaca. The play was commissioned for the theater, and they really wanted a handwoven item to be part of it. Hope it works! I've become very fond of homemade brined pickles, so today became pickle day. My CSA share had a big head of Napa cabbage, which is now on the way to becoming kimchi (with the eventual addition of garlic, ginger and red pepper). Another load of green beans is fermenting with elephant garlic, dill, jalapeno and cracked black pepper. The elephant garlic and jalapeno are in big chunks so they can be eaten solo :) Yum! Buki encountered his first sculls this morning when I took him to Cass Park along the Cayuga Inlet. He barked and barked and barked at these weird things on the water! 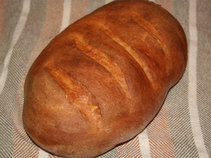 OK, I've been touting the Hearthkit, so here's a loaf baked on it (displayed, of course, on a handwoven towel in natural colored cottons :) It's a whole wheat buttermilk bread weighing in at 21 oz / 600 g, and it doubled in size while baking. Yum, nice sammich bread! I've been busy testing the HearthKit with great results. Cakes have baked evenly, an Irish soda bread rose well directly on the stone, and a round loaf of yeast bread more than doubled in size in the oven. Plus the crust was great! 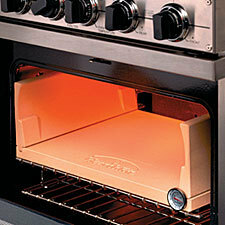 This is a HearthKit brick oven insert, and one just like it now resides in my oven*. It certainly evens out the heat, at least to judge by browning, and the first loaf of bread I tried had a pretty nice crust. The oven ran a while yesterday for the braised chicken. It started off again early this morning for a bar dessert that needs long refrigeration before serving, and I've got a batch of oatmeal bread rising right now. Whee! I get food, plus the furnace won't kick on. 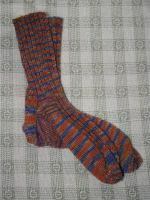 I finished another pair of socks, the third in recent months. These are based on seeded rib, which I highly recommend, because it's stretchy and also looks good when stretched. My current (tiny) knitting project is for Emma's new doll, a set consisting of a poncho, hat, and leg warmers. Last night was very cool, and since today's vegetable haul included peppers and kale, I've got my favorite braised chicken with assorted veg in the oven right now to warm the house. I'll probably continue by baking more bread. Oh, poor bruschetta! It tasted wonderful but didn't last - glass bowl slipped out of hand, bowl shattered, bruschetta died. Hint from Heloise: a bench knife is handy when removing a mix of glass and bruschetta from a kitchen floor. I'm hoping we'll get another eggplant this weekend, and I'll try again. On the other hand, the sourdough bread survived, and it was great. I used my perforated Italian two-loaf pan set on a baking stone, with ice cubes dropped periodically into a cast iron pan on the floor of the oven. Very nice crust! I got a nice eggplant yesterday in the veggie share and decided to make roast garlic and eggplant bruschetta. It's in the oven now and smells great. Then I'll bake some sourdough bread to transport it to my mouth. This is our first truly autumnal night/day of the season, and I'm exploiting it by doing long, slow rises for ciabatta. (In fact, the house is so cool, I had to put the dough in a very slightly pre-heated oven to kick-start the yeast! There are slow rises, and then there are interminable rises ...) I've also been reading the new King Arthur Flour Whole Grain Baking cookbook, which has a wonderful array of recipes. It has given me lots of ideas for the upcoming bake-to-heat-the-house season. I have been knitting, but I can't show pictures. Schaefer Yarn has introduced several new yarns, and I've worked up a design that is so very much not my taste (think 20-something Knitty-esque) in one of them. But it looks good, for something that isn't what I'd consider functional, and shows off the yarn nicely. 101 Designer One-Skein Wonders comes out on October 30. I'm hoping for no printing errors in my pattern this time! 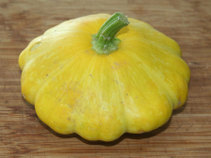 Well, this pattypan squash will get stuffed for dinner! Today's CSA haul was very nice: lots of squash, heirloom tomatoes, cherry tomatoes, heirloom fingerling potatoes, kale, leeks, and garlic. No lettuce, though - it bolted in last week's heat, so we won't have more for a couple of weeks. The garlic is German Red, which I have discovered keeps really well throughout the winter in a paper bag on the counter. (It probably helps that I only heat my house to about the temperature of a root cellar...) So I'm going to buy lots of garlic and potatoes from the farmer next month when the temp and humidity levels are lower in the house. More veggies are on the way. Some friends are on vacation this week, and I'll be picking up their CSA share from a different farm. It will be interesting to see what's growing over there. I was introduced to this concept last summer when friends of mine had me pick up (and eat!) their veggie share while they were away on vacation. Very appealing, particularly for a person like me who hates gardening. My friends' CSA didn't have room for new members (a pity, since they're but a short drive from home), but my next-door neighbor Samantha has been doing a lot of research, and we're going in together on a full share to another CSA. This one appeals to both of us because, along with a wide variety of vegetables, it also includes an unlimited share of berries. Mmmm, can you say fresh berry ice cream? I still may plant containers of assorted peppers and plum tomatoes on the southerly facing front patio, but those are freezer-friendly and easy to grow. However, they will need to wait until mid-May-ish when I can be reasonably sure that the thermal mass of the house will shelter the containers from a killing frost. A collection of knitted lace shawls, stoles and wimples. Many were done in handspun yarn. Click on an image for a larger picture and description, plus charts for some. These are all handknitted socks and other small items. Most of these were knitted from my own handspun yarn. Click on an image for a larger picture and description, plus charts for some. A collection of (mostly) knitted doll clothing. Back in the dark ages (as in pre-1987), I used to knit sweaters. Nowadays, I rarely do, so I'll use this album to record some of what I have done and may yet to be. Mostly handwoven items, mostly from commercial yarns. An assortment of fibers and handspun yarns.